I’ve been checking the weather forecast all week. With a race coming up I needed to get in one more outdoor run and the forecast was for temperatures in the mid 60’s by Saturday, needless to say I was giddy with the prospect. 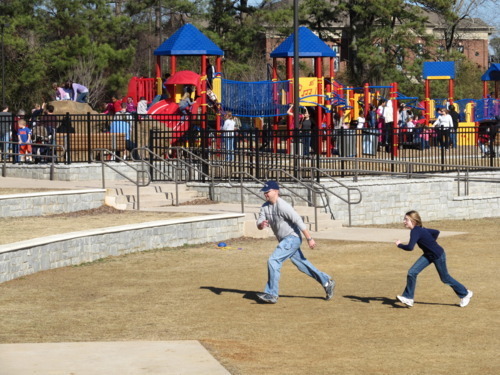 So Saturday afternoon, with the temperature at 65 degrees I set out for Alexander Park in Lawrenceville. Upon arrival the first thing I noticed was a lack of trees indicating that this park was fairly new. After further research I found that the park was actually opened in 2009. The next glaring reality was that the park was packed and the parking, limited. 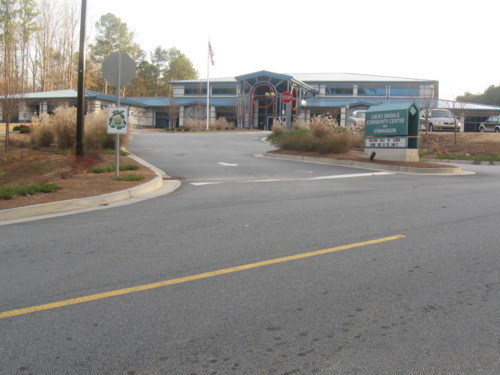 The main park entrance on Old Snellville Highway has a narrow paved lot followed by an unpaved lot and nearly all spaces were taken. 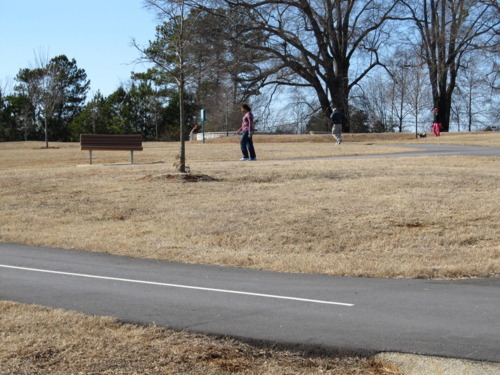 The front of the park has seating for performances and an open grassy area for kite flying, frisbee throwing and whatever else you can do in an open grassy area. Next to it is a small children’s play area with swings, a slide, a big boulder for climbing and an interesting set up that teaches children how to read braille. 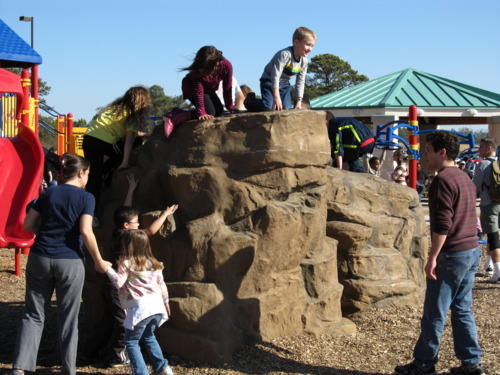 The play area was packed with children and their parents and could definitely be extended or an additional play area added somewhere else in the park for the children to enjoy. The paved trail according to the website is 1.4 miles and you have to assume that this is the paved trail that is lined for two “lanes”. I say assume because there are no mileage markers anywhere on the trail. The outer loop of the trail, even without trees is a good one. Starting out from the entrance and going right on the outer loop, it’s not particularly challenging, however the last stretch once you come back around to the entrance side is one long steady incline that burns the lungs and thighs. I saw one woman stop and think about whether she would continue or turnaround, she continued and so did I. That incline alone makes running here worth it. As much as I enjoyed the run, and seeing the children, the pond (where people actually fish) and the challenging incline, there were a few drawbacks as mentioned above. The parking situation leaves much to be desired and the children need a larger play area. Yet the biggest draw back was the DOG POOP. 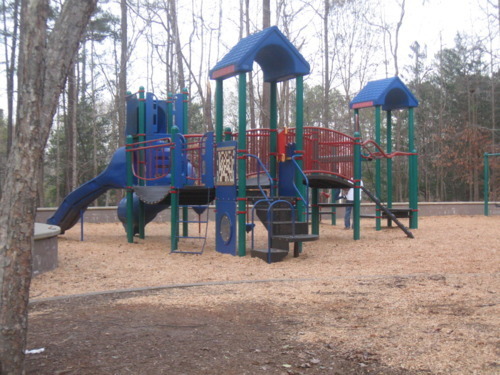 Every Gwinnett Park that I’ve been in has the “It’s your doodie” signs posted. For some reason, some folks IGNORE those signs and let their dogs poop on the paved trail and alongside it. The problem is especially troublesome on the back side. I mean the smell of dog poop mixed with wood chips is a bad combination. 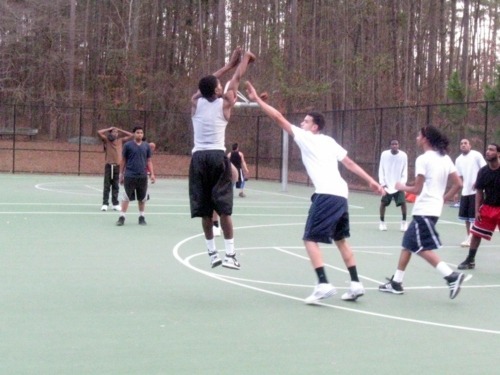 I’ll be contacting the Gwinnett Parks and Rec about this one. Overall I give a thumbs up with some caveats for Alexander Park. For running, walking and biking early mornings will likely be the best bet to miss the crowds and miss the heat during the summer. Off hours would also prove better for parking. 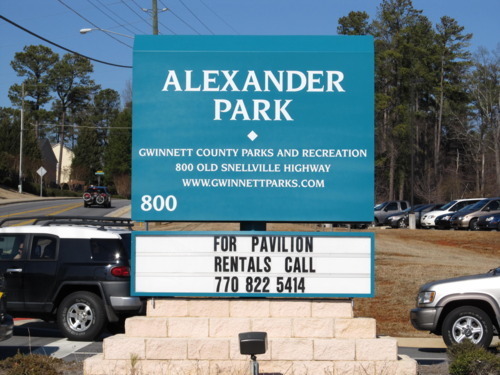 If you’ve been to Alexander Park, I’d love to hear what you thought. 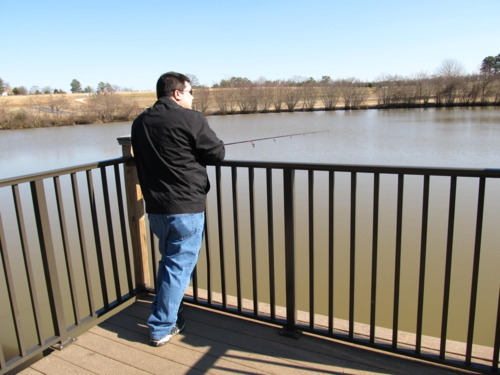 A day off, temperatures in the 60’s, last day of the year all ingredients for checking out another of Gwinnett’s finest, Lucky Shoals Park. Lucky Shoals on Brit Road just south of Jimmy Carter Blvd is beauty in simplicity with hills throw in for good measure. 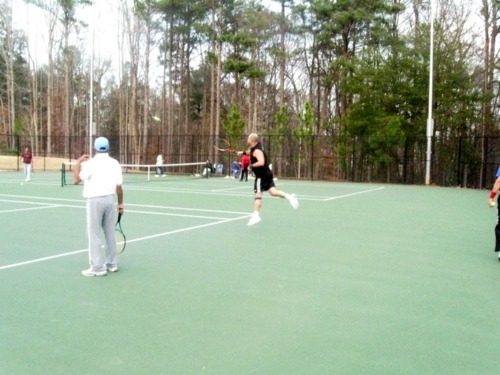 The park features, tennis and basketball courts, soccer and football fields, a childrens play area and best of all for runners and walkers a 1.14 mi paved trail. The trail is entirely tree covered which I’m sure is welcome relief during the sweltering summer months. That shade is needed also to give some relief from the inclines. I actually ran the course on Sunday with temps in the 40s and a bit of a breeze. The backside of the park is actually the high point so regardless of which direction you start the first half of the loop goes up. Great for your cardiovascular system and sure to make buns of steel with repeated outings. 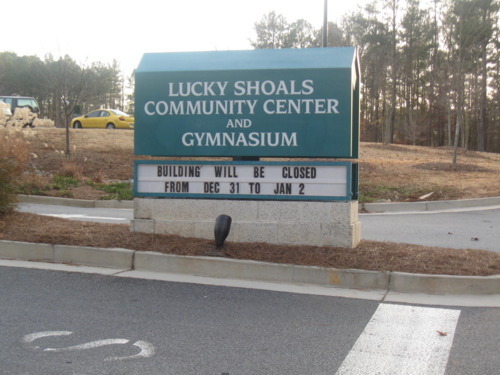 Lucky Shoals park has a great location bordering DeKalb and Gwinnett Counties, is easy to get to and is fairly well maintained. The trail is challenging enough to make you pay attention to your breathing. The only drawback is the paving. Certain sections of the trail have been repaved others have not. 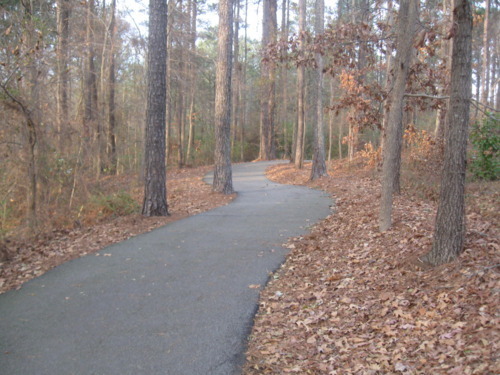 Runners and walkers should watch their step in areas where the tree roots are buckling the pavement. 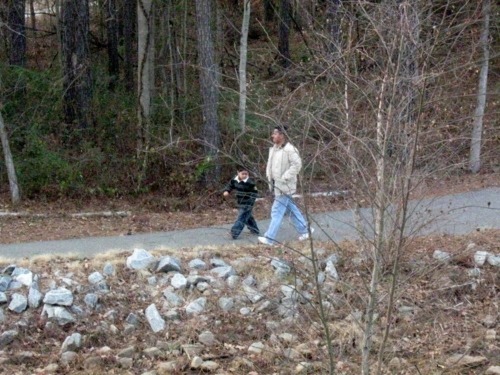 For more information on Lucky Shoals Park see go to the Gwinnett Parks and Recreation website.